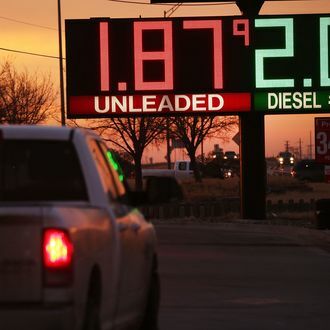 Crude oil is approaching its lowest price in over a decade, with benchmark prices hovering around $28 a barrel Tuesday afternoon. The dip came shortly after the International Energy Agency announced that oil supply would outstrip demand in 2016 by an even greater margin than initially anticipated. With demand easing and Iran and Iraq bolstering production, the IEA now expects supply to outstrip consumption by 1.75 million barrels a day — up from an estimate of 1.5 million last month. Spedding notes that oil’s plunge, from $120 per barrel in 2014 to under $30 today, was the result of a mere 2 percent change in the supply-demand balance. Thus, he argues even incremental measures to reduce carbon consumption could significantly depress prices. And since developing a new drilling site can often take several years, investors might begin fearing the risk inherent to backing such operations in a world of ever-advancing alternative energy sources and international climate agreements. If Spedding’s analysis bears out, it would obviously be great news for anyone who cares about the future of planet Earth. One of the greatest challenges facing efforts to combat climate change is the enormous amount of wealth stored in oil that can’t be mined if catastrophe is to be averted.